one size - circumference 24", length 8"
A basketweave check pattern and a little bit of lace makes Checks, Please! a great little accessory you’ll want more than one of. The stitch pattern is easy to memorize so this project will be one that you’ll want to have with you wherever you knit. 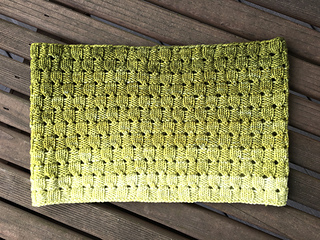 It works up quickly, shows off gradient yarns perfectly and is ideal for using up those last bits of yarn you have left over from other projects!